MORE than 21,000 pupils at schools in Northern Ireland had a serious problem with their attendance during the last academic year, The Detail can reveal. Figures on attendance rates for every primary, secondary and grammar school have been released to The Detail by the Department of Education (DENI) in response to a Freedom of Information request. Detailed statistics for each of the 1,067 schools – which can be accessed in the interactive map above – show that attendance for tens of thousands of pupils dropped below the crucial level of 85% of all half school days. This is the point at which pupils can be referred to the Education Welfare Service (EWS) which may then formally intervene with families. The department’s data relates to a total of 272,397 pupils who were of compulsory school age (Years 1 – 12) in the 2010/11 academic year. Attendance or absence is measured for every pupil in half day sessions (am and pm) and each year there are 190 statutory school days. There is known to be a link between regular school attendance and pupils’ educational attainment and parents and guardians have a legal duty to ensure that children attend school. In cases of extremely poor attendance, sanctions can be imposed on parents/guardians. This includes a referral to the EWS and could lead to prosecution resulting in a fine or – in more extreme circumstances – an Education Supervision Order or Care Order. Figures obtained by The Detail last year on people sent to jail for fine defaulting in Northern Ireland show that three people were imprisoned in 2008 and 2009 for failing to pay fines imposed for allowing their children to be absent from school. The parents’ fines ranged from £165 to £755 and their sentences were between seven and 28 days long. The average pupil attendance across all schools in Northern Ireland in the last school year was 94%. However, our analysis of the department’s figures shows that the attendance levels for at least 20,914 pupils fell below the critical level of 85% of the total half days. Schools are expected to take action on falling attendance before this point in the form of letters written to parents and meetings with them. When levels falls below 85%, a referral from the school to the EWS can result in a home visit and an action plan being drawn up in a bid to improve attendance. Almost 12% of pupils enrolled in post-primary schools were absent for more than 15% of the total half days – compared to 5% in primary schools. However, the exact poor attendance toll cannot be calculated. From the data provided we know that 20,914 pupils had attendance levels of less than 85%. The precise figures for schools with less than five pupils with attendance less than 85% were not provided by the department because of the risk of identification of pupils – this was applied to 299 schools so could mean up to a further 1,196 pupils. And no attendance data was provided for 13 schools which closed before figures for the 2010/11 school year could be given to the department. The full data released by the department is available in Excel format below this article. In a response to a recent written Assembly question, Education Minister John O’Dowd provided figures for the rate per thousand of 15 to 17-year-olds with less than 85% attendance – broken down by council area and electoral ward. Strabane (155 per thousand) and Belfast (140 per thousand) topped the council list for poor attendance. Our interactive map features 68 grammars, 15 prep schools, 149 secondaries and 835 primary schools. We did not request a breakdown of figures for each special school where 43.8% of all absent half days were due to illness. Attendance figures for 2011/12 school year will not be released until 2013. Attendance figures for all grant-aided primary, post-primary and special schools are collected in the school census in October each year. The figures provided to us by the department include each school’s overall attendance rate, a breakdown of each school’s ‘authorised’ and ‘unauthorised’ absences and the percentage of pupils with poor attendance. From this, we calculated the number of pupils with poor attendance, where possible. Permitted authorised absences include bereavement, suspension, medical/dental appointments and illness. An unauthorised absence is when permission is not given due to “unexplained or unjustified absence” – for example a family holiday which has not been agreed to by the school. Department statistics show that illness accounted for 59% of all absent half days in primary schools during 2010/11 and 48% in post-primary schools. The level of overall absence in secondary schools was 9.1% of the total half days – much higher than the 4.6% in grammars. And the proportion of total half days missed due to suspension from post-primary schools was more than three times higher for males than for females. There are many factors which can influence schools’ attendance rates and which will not be within the data we are publishing today – for example, long term sickness. A small number of pupils with poor attendance can also skew overall attendance rates in small schools. Irish traveller children attending primary schools had a higher overall absence rate than any other ethnic group. They missed 30% of the total half days – compared to 5% for white children. 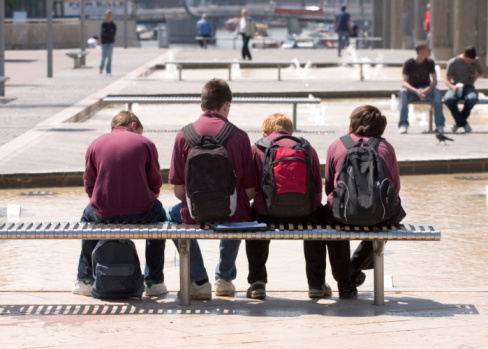 Traveller absence rose to 43% in post-primary schools. Poor attendance is often linked to deprivation levels so we also requested the percentage of pupils in each school entitled to free school meals – an indicator which is generally used to signify levels of deprivation. 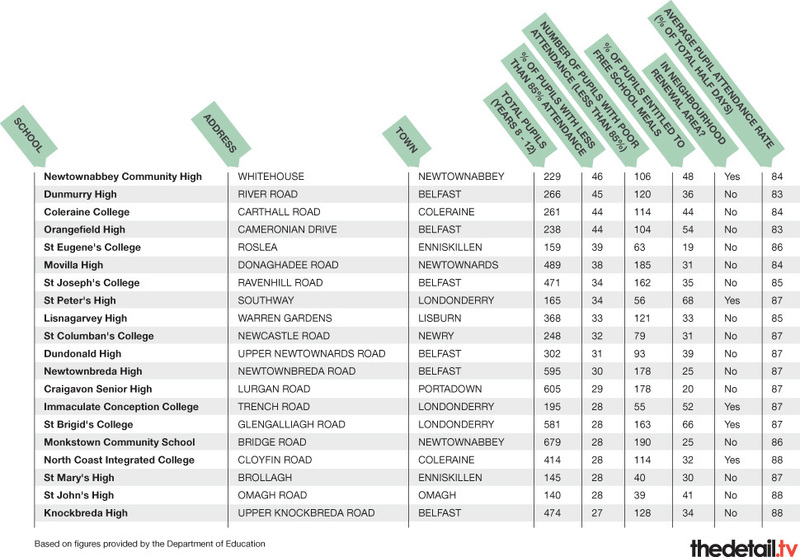 Our tables also include whether or not each school is in a Neighbourhood Renewal Area – these are the 36 most deprived areas of Northern Ireland. We have created two tables which show the primary schools and post-primary schools with the highest percentage of pupils with attendance less than 85%. The school with the lowest average pupil attendance rate (59% of all half days) and also the highest percentage of pupils with attendance less than 85% (60% of pupils) was St Mary’s Primary in Belfast’s Divis Street – 90% of the pupils at this school are from the traveller community. The principal of St Mary’s Primary, Mary Harbinson, said: “It is very unfortunate that the figures given include the attendance figures for extremely nomadic pupils who attend our school for short periods of perhaps only a few days in a term. 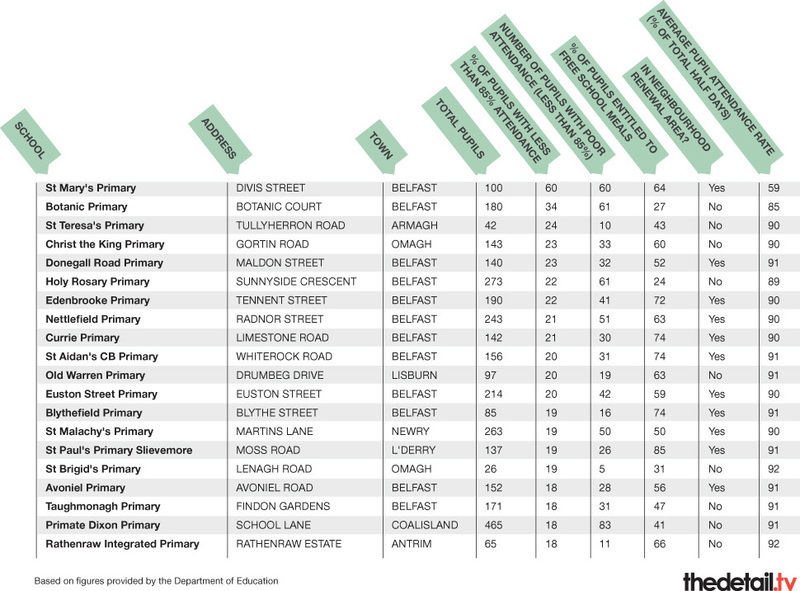 Botanic Primary in Belfast was the primary school with the second highest percentage of pupils with poor attendance. The department’s figures show that 34% of the pupils had an attendance rate of below 85% last year and that the average overall pupil attendance rate was 85%. Mr Bell added that there has been a marked improvement in attendance this year as a result of a support class introduced for pupils with barriers to learning. The secondary school with the highest percentage of pupils with poor attendance was Newtownabbey Community High in Co Antrim. At this school, 46% of pupils had an attendance rate of below 85% and the average overall pupil attendance rate was 84%. John Lewis, principal of Newtownabbey Community High, said that pupil attendance has dramatically improved in the last year as a result of new attendance projects. He said that whole school attendance has risen from 84% to 88% and the percentage of pupils with attendance below 85% has dropped to 27%. To read a more detailed version of the comments provided by the principals at these three schools, click here. The three schools with the best overall average pupil attendance rate of 99% were all primaries – St Macnisius’ Primary School in Tannaghmore (Co Antrim), Bellaghy Primary and Creggan Primary in Randalstown. The post-primary schools with the highest average attendance rate of 97% were all in the grammar sector – Friends’ School Lisburn, St Patrick’s Grammar in Armagh, Aquinas Diocesan Grammar in Belfast, Ballymena Academy, Dalriada School in Ballymoney, Sullivan Upper in Holywood, Lumen Christi College in Derry and Rathmore Grammar in Belfast. The highest average attendance among secondary schools was 96% and this was achieved by St Comhghall’s College in Lisnaskea and St Patrick’s High in Keady. At 65 schools – 53 secondary and 12 primary – at least 20% of pupils had a poor attendance rate of less than 85%. Some schools buck the trend of poor attendance being linked to high free school meal entitlement – although many are in the primary sector. For example, 75% of the pupils at Holy Child Primary in Derry are entitled to free meals and it is also in a neighbourhood renewal area. But only 7% of its 218 pupils had an attendance rate below 85% in 2010/11 and the overall average pupil attendance rate was 93%. Last week, Education Minister John O’Dowd launched research on improving attendance in schools serving deprived areas. A range of strategies which the department said could be used to promote good attendance includes implementation of an attendance policy and targets, reward schemes for good attendance, additional support and strategies for poor attendees and links between schools and parents/wider community. The department commissioned RSM McClure Watters to undertake the research which included a survey of schools. Only 59% of schools who responded to the survey said that their school had an attendance policy in place and 64% said their school had a target for pupil attendance in their school development plan. Currently there is no requirement for schools to have an attendance policy however the report authors recommended that the department provides guidance to schools on the need to introduce policies. •	An attendance co-ordinator is employed at Belfast Model School for Girls to work one-to-one with pupils with attendance issues and to carry out group work and home visits if necessary. A review for 2011 found this intervention for 30 girls in Years 8, 9 and 10 had been very successful. There was an average increase in attendance of 8% – bringing the pupils’ overall attendance rate above the 90% mark. Funding has recently been secured from the department which will fund the Full Service Programme (including the attendance co-ordinator) up to March 2015. •	Kilcooley Primary School in Bangor runs an incentive scheme with certificates for full attendance each month, certificates for best class attendance each term and a cinema ticket for full attendance all year. •	Corpus Christi College in Belfast worked with Bombardier to reward pupils with 100% attendance each term with a flight around Northern Ireland. Over the course of the year around 300 boys were rewarded with the flight. •	Teachers from St Gemma’s High in Belfast make home visits for both positive and negative reasons. As well as dealing with poor attendance, if the parents or pupils have done well in addressing their attendance issues the teacher will go out to tell the parents how well they have done. WHAT IS THE DEPARTMENT OF EDUCATION DOING ABOUT IT? Every school has a link Education and Welfare Officer (EWO) employed by the relevant education board whose aim is to reduce unnecessary absences from school by offering support and help to pupils, parents and schools. However, the Department of Education appeared to take a more relaxed view when we asked for a comment on what support was provided for the 21,000 pupils known to have poor attendance last year. A DENI spokeswoman said: “Not all pupils with an attendance rate below 85% are automatically referred to EWS. “It is the responsibility of schools to refer pupils to the EWS when the attendance of a pupil causes concern and the school’s own efforts to resolve the situation have been unsuccessful. The 85% attendance figure is a guideline and the school makes a judgement on whether a referral is appropriate. One inner city primary school principal told The Detail about their difficulty in getting support for one of their pupils. The DENI spokeswoman said that school attendance is an issue that the Minister and his department take very seriously. She continued: “Regular attendance is essential if children are to benefit fully from their time in education. “It is important to note that parents and guardians have a legal duty to ensure their child’s regular and punctual attendance at schools and sanctions may be imposed if parents fail to comply. However, schools also play a very important role. They must provide a support system for those who are most vulnerable, and encourage a culture of regular attendance by everyone. “The Education Welfare Service provides valuable support to schools through proactive work on developing attendance policies and identifying problems. They encourage schools to refer pupils when there are concerns about attendance and each school has access to an Education and Welfare Officer who will work with pupils, parents and teachers to identify barriers to attendance and try to resolve any issues or concerns. “The Education and Welfare Officer can put parents in touch with other agencies that may be able to offer further advice and help if necessary. “The research findings which were published on the Department’s website on May 21st will be used to develop guidance for schools to support them in tackling this problem."